When big tech and Silicon Valley joined with social media giants to collude and deplatform Alex Jones, ANP headlined with "First They Came for Alex Jones... Tomorrow We Will All Be Alex Jones," because whether one agrees, disagrees, likes or dislikes the content, presentation, or even the Independent Media personality in question, we felt everyone should be highly concerned about the overt and blatant collusion to silence and censor anyone online by preventing them from reaching and building their audiences. 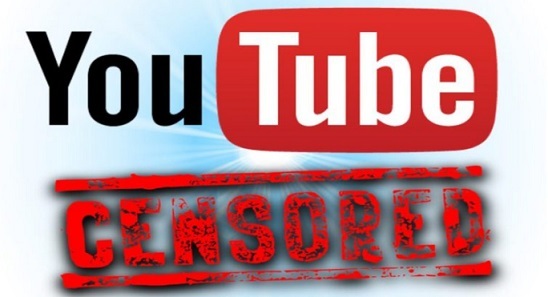 The liberal establishment media pushed back against the censorship and silencing assertion by claiming "he still has a website," and "Alex still has a radio show," but those arguments are inherently dishonest because what big tech, social media giants and Silicon Valley was doing was far worse, they were preventing his audience on a number of platforms from accessing him using their services, quite literally taking their users right to listen, see, and comment on any content they chose. That was not just an attack on Alex Jones, that was an attack against every single one of their own users. 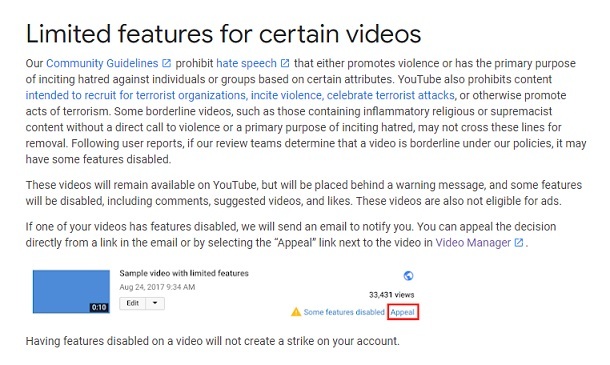 Thanks to a comment left this morning by a reader, we see another Aleternative Media voice is being silenced, as well as insidiously slandered in an attempt to associate her with "hate speech" by linking to a "learn more" option to describe why Google's YouTube had disabled and limited certain features on her video. It is a Lisa Haven video, titled "Martial Law Dead Ahead? 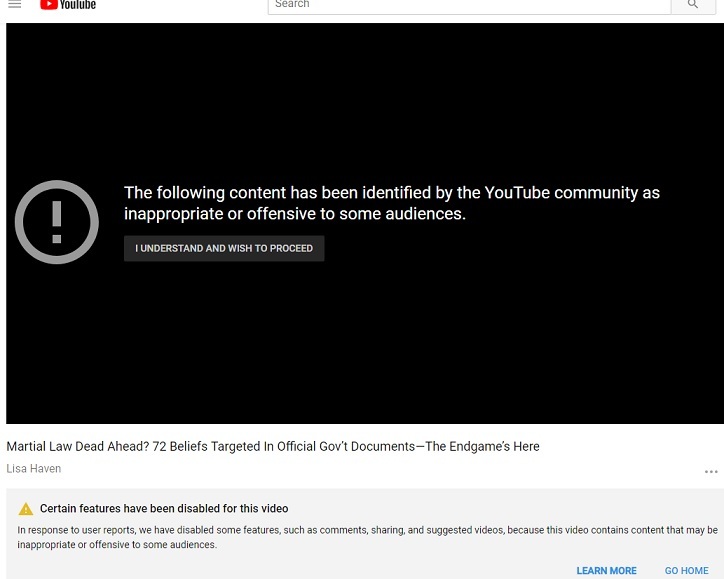 72 Beliefs Targeted In Official Gov’t Documents—The Endgame’s Here," and the screen shot below is what her audience and anyone that may have happened across her video and channel for the first time, sees. So they haven't only silenced and censored Lisa's voice from being shared, they have also censored other YouTube users ability to share something they may have found worthy of sharing. Another way they have censored their own YouTube users is by shutting down the commenting on that video. Slander: Perhaps the most egregious action is the link YouTube takes you to when you click the "Learn More," (bottom of the screen shot above). If one of your videos has features disabled, we will send an email to notify you. You can appeal the decision directly from a link in the email or by selecting the “Appeal” link next to the video in Video Manager. Emphasis mine, and I will explain why beneath the screen shot below. Think about how insidious this type of slander by association that "learn more" page truly is. First let me say I have spoken to Lisa Haven before, while I may agree with some of her content, or disagree with some, I can say without a doubt Lisa does not promote violence, incite violence, recruit terrorists, celebrate terror attacks or practice hate speech in her work or videos. Yet anyone unfamiliar with her work that clicked the "learn more" option YouTube put beneath her video would be left with the impression that she does. Building an audience for a website or video channel is not an easy thing, it is dependent on other websites linking to you, or word of mouth, or followers sharing your work with others, or being found in search results, along with a number of other methods to promote content to build an audience, and YouTube has just basically told any newcomers to her channel that her content promotes violence. It does not. Let me say that again a little louder. IT DOES NOT. At this point, even if Lisa appeals and wins the appeal and has all the features restored, one has to ask, how many people that have never seen her work will now never listen or read her work because they are now under an erroneous assumption because of YouTube's misleading description of why her content was censored? "Hate" was the same type of excuse and justification a whole host of services used to justify deplatforming Alex Jones, labeling anyone that promoted ideas or theories that challenge the liberal establishment media's narratives, as "hate speech." For Facebook, they use the umbrella term "inauthentic behavior" to justify deleting conservative content, accounts and pages, yet they too used the "hate" label against Jones. They label Trump supporters as racist, "alt-right," then conflate alt-right with the term White Nationalism," and then conflate that term with "White Supremacy," in order to lump it all together to claim that conservative Independent voices are all racist, Islamophobic, Misogynistic, homophobe, (insert all the other fake descriptors here), deplorables. Make no mistake, they do this for no other reason than to attempt to justify censoring, blocking, banning, shadow banning, conservatives voices from their platforms. Back in August 2018, I wrote that "Tomorrow We Will All Be Alex Jones," and we see from the documented cases of conservative censorship since then, that tomorrow is here. The only way to counter this type of insidious censorship is for other Independent Media sites to speak up for those being silenced, document what Silicon Valley is doing, and provide links, and share the work of those they are trying to destroy with our own readers. The internet is big enough for all of us, so we need to help each other bypass the censorship. Lisa Haven's website is here. Her Brighteon Channel is here.